Genome packaging is a universal process in eukaryotes. In the smallest repeating unit of the packaged genetic material, or chromatin, ~150 DNA base pairs wrap around a core of histone proteins, forming the nucleosome. The large number of histone-DNA interactions within a nucleosome would make its DNA largely inaccessible, turning the nucleosome into a roadblock to DNA-based transactions. However, a better understanding of the biophysical properties of the nucleosome and the factors that regulate them has made it clear over the last decade that the nucleosome is intrinsically dynamic. The cell regulates DNA accessibility by fine-tuning this property. Histone modifications, such as methylation and acetylation, or incorporation of histone variants can alter nucleosomal dynamics. In addition, ATP-dependent chromatin remodelers regulate the position and composition of nucleosomes across the genome. At gene promoters, this multi-layered regulation gives rise to a nucleosome-depleted region (NDR) flanked by positionally stable nucleosomes enriched in the histone variant H2A.Z. Due to their role in establishing and maintaining this stereotypical promoter chromatin structure, remodelers have been a topic of intense research in the past two decades. Remodelers are multi-subunit complexes characterized by a conserved core ATPase responsible for breaking histone-DNA contacts. This necessary step is harnessed by different remodelers to yield a number of remodeling outcomes, among which are the repositioning and disassembly of nucleosomes. A major question in the chromatin field is how the diversity in cis-regulatory domains and accessory subunits gives rise to the functional specialization of remodelers. Structural approaches can be used to address this question; however, their complex compositions (2-15 subunits) and large sizes (200 kDa to >1 MDa) make remodelers challenging subjects. Information gained from a limited number of electron microscopy (EM) structural studies indicates that larger remodelers (~1 MDa), such as RSC and SWI/SNF, contain a central cavity or hub that interacts extensively with the nucleosome substrate. However, because of the very limited structural information on the components of these remodelers, it has proven very difficult to assign functionalities to the three-dimensional EM structures. Over 10 years ago, three research groups simultaneously discovered the SWR1 complex in Saccharomyces cerevisiae and demonstrated its novel remodeling activity—histone-dimer exchange. SWR1 swaps a H2A.Z/H2B dimer for a canonical H2A/H2B dimer, thereby regulating the distribution of the important variant H2A.Z across the genome. This reaction relies on the conserved ATPase that underlies nucleosome repositioning and disassembly by other complexes, making SWR1 a prime target to address the functional diversification of remodelers. 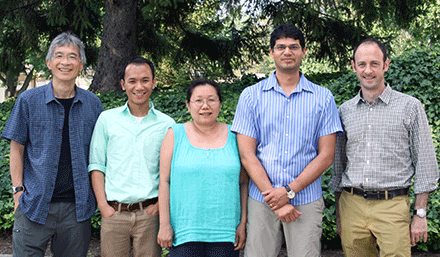 The group of Carl Wu (NCI/NIH and Janelia Farm) has been the main contributor to the biochemical dissection of the assembly of this ~1 MDa complex. Their work revealed that the 14 subunits of SWR1 associate as 4 functional modules: the catalytic subunit Swr1, two multi-subunit modules that interact with the substrate nucleosome and the H2A.Z/H2B dimer, and the putative hexameric AAA+ proteins Rvb1/Rvb2. This assembly map paved the way for the next question to be addressed: How do these modules assemble into a dimer-exchanging machine? In a recent paper published in Cell, the Leschziner lab in MCB, in collaboration with the groups of Carl Wu and Ruedi Aebersold (ETH-Zurich), reported the three-dimensional structure of this important remodeler. The team, led by MCO student Vu Nguyen, used a combination of cryo-electron microscopy (cryo-EM), biochemistry and proteomics to dissect in detail the molecular architecture of SWR1. Their results show that Rvb1 and Rvb2 form a single heterohexameric ring upon which the two substrate-binding modules, which form structurally discrete entities, dock side-by-side. The core ATPase is found at a peripheral position distal from the ring. The SWR1 structure is a major first step towards understanding the functional link between the Rvb1/Rvb2 hexameric ring and dimer exchange. The authors suggest that the ring serves as an assembly platform for the substrate-handling modules and that their resulting side-by-side arrangement may be central to proper spatial coordination of the two substrates during exchange. The authors also characterized a SWR1-nucleosome co-complex, revealing a significant conformational change involving the catalytic ATPase and the H2A.Z/H2B-binding module. Interestingly, SWR1 appears to form limited contacts with the substrate, in contrast to remodelers responsible for repositioning or disassembling the nucleosome. The authors speculate that this distinction reflects unique mechanistic aspects of the exchange activity, which in theory does not require extensive disruption of histone-DNA contacts. This study provides a structural foundation upon which further conformational dynamics occurring during dimer exchange can be probed. The Leschziner group is now pursuing higher-resolution structures of the complex in different substrate- and nucleotide-bound states, with the long-term goal of establishing the structural basis for the dimer-exchange reaction catalyzed by SWR1. In the same issue of Cell, the Hopfner and Beckmann groups (Ludwig-Maximilians University, Munich) reported the cryo-EM structure of the remodeler INO80. Considered to be SWR1’s sister complex, both functionally and compositionally, INO80 and SWR1 contain highly similar catalytic subunits and share 4 identical subunits, including Rvb1 and Rvb2. These components make up > 50% of their molecular weights. However, the two reported structures are vastly different. Perhaps the largest distinction lies in the interpretation that INO80 contains a dodecameric, or double-ring, assembly of Rvb1/Rvb2, in contrast to SWR1’s single ring. These results should spur further research into the structural basis underlying the functional divergence between SWR1 and INO80, with the latter being capable of both repositioning and dimer exchange. In a broader context, following a long hiatus in structural studies of the large remodelers, these recent studies bring much needed information to the remodeling field. Collaborative efforts in elucidating structures of remodelers from different families will accelerate our progress in understanding the functional diversity of these complex molecular machines.